Sometimes specific geologic formations take on a special, almost mythical, aspect to them. The Kem Kem beds of Morocco and Algeria definitely have that "special" quality to them. Documenting a roughly 10 million year span of the Cenomanian in the early Late Cretaceous, the formation represents several transgressive and regressive cycles of a coastal system on the southern Tethys Sea. Generally referred to as a "deltaic" environment, the Kem Kem contained a variety of environments within it- including offshore rudistid reefs, mangrove type forests, tidal rivers, floodplains and estuaries. But everywhere water was a dominant feature. The water was not necessarily all from precipitation- climatic models for this time predict arid conditions towards the equator- and rainfall when it occurred was episodic and monsonal. Picture the Kem Kem more like Arnhem land in the Northern Territory of Australia than the Amazon delta. No, the large amount of water was due to a very low gradient of land approaching high epicontintental seas. Ocean bound water slowed down and intermingled with waters from the Tethys creating a massive land sea interface on a continental scale- the magnitude of which we do not see today- perhaps the Sunderbans of India come close. Of course given this immense land/sea mosaic we would expect mangrove forests to dominate- except mangrove trees, which are angiosperms, had not yet evolved. Instead we had forests of Weichselia reticulata, a halophytic (salt tolerant) tree fern that was likely the dominant member of the intertidal floral community. Also common would have been various halophytic members of cheirolepidaceae- an extinct order of diverse coniferous plants- such as Frenelopsis. Herbaceous ferns, horsetails, and charyphytic algae rounded out the plant community. Thriving amongst these various watery microhabitats was a diverse assortment of fish. Amongst the more notable fish were a variety of medium to large sharks, coelecanths, bowfins, elasmobranchs, tarpons, lungfish, and even planktivorous paddlefish types. Adding to the diversity was a variety of marine reptiles, pterosaurs, turtles, crocodiles, snakes, and lizards. In a rather extensive review of the Kem Kem beds distinct faunas emerged relating to sea level and showing several biogeographic affinities to other marine/terrestrial provinces. 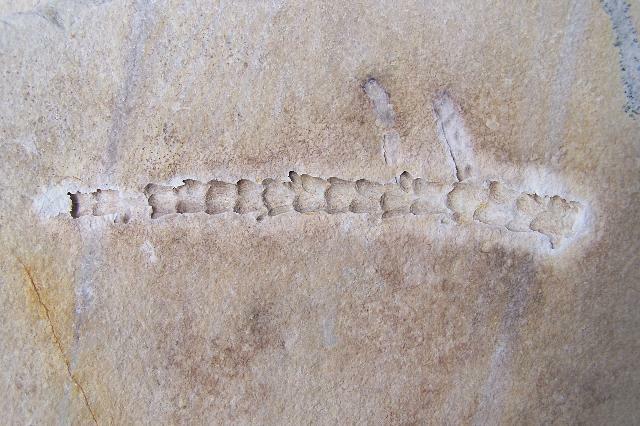 Of course what attracts the most attention, rightfully so, is the dinosaur remains from the Kem Kem. While several sauropods were present and ornithopod remains are sporadic as well what the Kem Kem does offer is a rather large assortment of multi-tonne theropods. And these guys were literally "whale sized". So let's disregard the two smaller grey theropods- they are "problematic" to say the least. 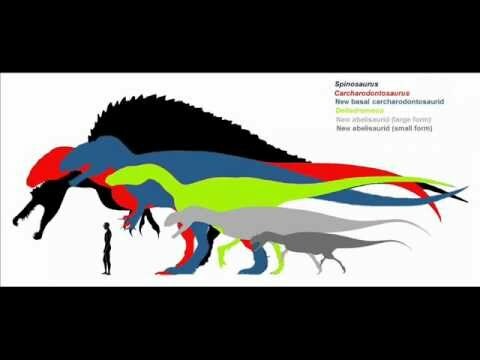 That still leaves you with the respectably sized Deltadromeus (green), gargantuan Spinosaurus (black), massive Carcharodontosaurus (red) and... who is that guy in blue? The guy in blue represents a potentially even more massive, as yet unnamed, basal carcharodontosaurid represented by basically a chunk of its braincase. Read about it here. Well let's look at the ecosystem from the perspective of the most dominant feature present- water. Modern mangrove ecosystems are very productive places. But even in modern mangroves we don't really see anything analogous to say a seven tonne spinosaur tromping about. What was different in these areas from the present? Let's look a little lower on the food chain. What really sets the Kem Kem apart is the abundance, diversity, and wealth of relatively large fish. If we look at modern large coastal fish we can draw some rough parallels. Many coastal fish do not typically stay in a single microhabitat. Barramundi, able to tolerate a variety of salinities (euryhaline), is known to descend downstream from its inland rivers into estuaries/tidal flats to breed. Tarpons (genus Megalops) are also euryhaline except that the fry are born in open ocean and then move in progressively closer to shore and sometimes into fresh water as they mature. Some species can reach 23 feet in length and several tonnes in weight and all species can easily go between salt and freshwater habitats. And the Kem Kem is well known for having its own giant sawfish, the 8 meter long Onchopristis, often posited as a fave prey of spinos. So what can be gleened from all this? Well all of the above fish are large, tropical, and are known for travelling between, among, and throughout various nearshore/offshore, estuarine, upriver habits in all kinds of combinations- seasonally or at will. The Kem Kem, with an even greater variety of large- most probably euryhaline- fish, was likely the focal point of energy transfer from both offshore, local, and inland water ecosystems. Combined minimal to nonexistent seasonal change, high epicontinental seas, and abundant primary productivity and you have a fish monger's dream. Russel (2009) suggested fish were the basis for the food chain- culminating in the large predaceous theropods. I tend to agree with this statement. Although the case for spinos being sushi lovers is pretty iron-clad at this point- what about the several large carch species as well as Deltadromeus? Well, just because they have no clear adaptations towards piscivory like spinos do does not mean that fish- or aquatic organisms in general- were not a mainstay of their diets. Plenty of large typically terrestrial predators habitually take advantage of water based prey- jaguars, various bears, wolves to name a few- especially during seasonal migrations or when drought/geography funnel water prey into easily caught situations. Various crocodile species are well known for predicting fish movements and taking advantage of specific sites where fish are easily caught. Theropods, by no means brainiacs, were at least as cunning as crocodiles at predicting spots to opportunistically take advantage of certain hard to get prey items. And even if the large theropods aside from spinosaurs were clumsy fishers don't forget about stealing your fish dinner!!! Indeed this form of piscivorous kleptoparasitism is rampant in extant theropods. Maybe carchs habitually followed spinos and stole their fish...Maybe the efficient fish hunting spinos were key to the success of the other theropods- much as wolves indirectly benefit bears and other scavengers through their kills. Remember the first Planet Predator I did a while back about the seeming paradox of a predator dominated ecosystem? One of the keys to the sustainability of such an ecosystem with 80% predator biomass is that the prey base rapidly replenishes itself to sustain the losses. Well in the Kem Kem we may actually have a parallel situation with numerous fish species- many possibly rapid reproducers- supporting a top heavy cast of large predatory fish, pterosaurs, crocodiles, and theropods. Did the biomass of theropods and other top predators approach 80%- probably not, especially in light of the fact that the dinos were probably endothermic- but there is every possibility that it was higher than you might expect in a typical terrestrial plant>herbivore>carnivore pyramid. Here's why. 1) Abundant, rapidly replenishing fish prey base. The low continental relief combined with high consistent temps, epicontinental seas and productive mangrove/deltaic environment doubtless supported large nurseries of small fish and an unparalleled diversity of large, euryhaline fish. These fish likely moved between all environments distributing nutrients accordingly. 2) The predators themselves. Take a look at the pic in the beginning of the post. 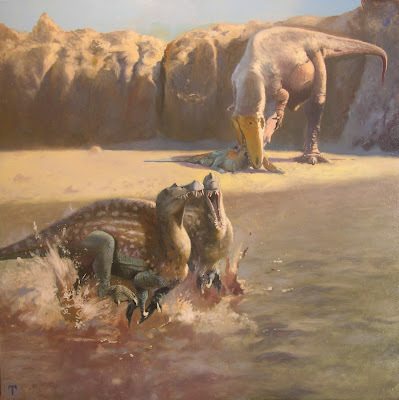 What it depicts is a large adult carch that has used a natural rock formation on abeach to pin down three immature spinos and kill one of them. A very realistic example of intraguild predation. Then go review this article and read about intraguild predation in raptors and monitors. Its quite possible intraguild predation was par for the course in these theropods. 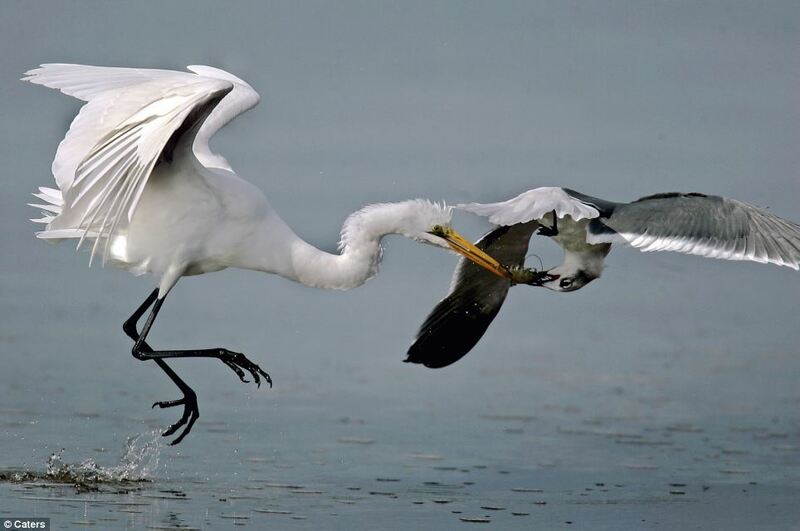 The theropods, especially given their reproductive capacity and size envelop from hatchling to adult, were partially acting as their own prey base! 3) Nary a herbivorous dino around. Its quite possible that the theropod diversity and numbers in the Kem Kem, buoyed up by abundant aquatic resources, were an active deterrent to abundant herbivorous dinos- despite the abundance of plants in these mangrove/deltaic conditions. Much like we saw in Shark Bay where the mere presence of tiger sharks was inhibiting foraging efforts by dugongs, dolphins, and cormorants- the abundance of theropods in the Kem Kem was simply not worth the effort for dino herbivores. So how did the lack of dino herbivores bolster theropod numbers? Well if the dinos were not eating the plants that means inverts were taking up the slack- insects, millipedes, snails, crabs, shrimp. It also means more decaying vegetation- which enriches the waters further- more food for the fish. In either case- more bugs or more nutrient rich water- the fish are happier. The fish are happier- the theropods are happier as well. The exclusion of abundant dino herbivores allowed a feedback loop which benefitted fish and theropod. 4) Spinosaurus was key. Of the four large theropods Spinosaurus was the only one specialized towards piscivory (crocodile jaws, pressure sensing snout, gaff like hand claws). The other theropods were likely not as efficient fishers. 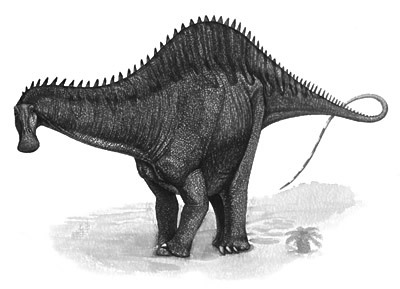 They may have benefitted from the presence of spinosaurs by either stealing or scavenging their catches or using spinos directly as prey in lieu of herbivorous dinos. In either case spinos were the keystone species- the presence of which affected all others. Nah, I like the idea of a theropod dino dominated habit thriving on fish/aquatic animals. Herbivorous dinosaurs need not even be involved in this food web. Aspects of this type of ecosystem are not unparalleled. If we look to pristine reefs with tremendous top predator biomass we see potentially analogous characteristics. And if we look at the type of exclusionary actions abundant large predators impose on other animals (tiger sharks in Shark Bay, wolves in Yellowstone) this situation in the Kem Kem is not without precedent. Today I woke up and sniffed out the remains of a 5 meter sawfish hauled to shore by some spinosaurs from the night before. Left a little hungry but slept the rest of the warm day. Woke up at 3 am to the sound of several large stomatosuchid crocodiles scooping up schools of fish in some shallow water. I knew the bay they were in and I knew if I could approach from deeper water I could probably snag one. I did it! - several of the larger 6 meter guys got away but I snatched up a good 4 meter croc which slid down my gullet in one swallow... Slept for three days in a row, I have not seen a carch larger than myself (about 13 m and 4 tonnes) in several months so I feel pretty confident in napping whenever and wherever. Several years ago at about 10 meters I had to watch out for larger carchs as well as large adult spinos- my left arm was pulled off by a big bruiser of a spino at about 16 meters, Now even these guys leave me alone and I routinely steal fish from spinos up to about 14 meters. I start making my way upriver as it was about this time last year that large schools of coelecanth congregated to breed in some pretty dense horsetail beds where the water is more fresh tasting (I do have salt glands to deal with drinking salty water). Even if I don't catch a fish chances are I could steal one from the abundant spinos that congregate for the fish- or even kill a small spino if given the chance. Along the way I cross some open dry terrain and smell my old nemesis Deltadromeus. Until I was about 8 meters long these guys really gave me a hard time. Pretty much all of my clutch-mates were gobbled up by these annoying speed demons. They were always faster than me and I would generally back myself into a corner to avoid their annoying but not very strong bites. Now I hunt them whenever I get the chance. They tend to avoid the deeper waters and denser forests where their speed is neutralized but I have got them before- usually in the chaotic monsoon when I can sneak up on 'em undetected. I finally reach the horsetail beds after several days travel. Over the years I have refined my hunting technique for these strong, maneuverable fish. I know of one spring fed pool, clear and deep where they like to breed. Leading to it is a small channel, only about 3 meters across and surrounded by dense cycads on either side. I set up my ambush site here and catch the 50 kg fish pretty consistently over several days. On the third day I notice a sound I had not heard for several months- a herd of rebbachisaurus sauropods. I used to hunt these guys all the time before I discovered its a lot easier to be a hooligan in the delta. Even a midsize one can pack a whallop with its tail and I've been injured by these brutes before. Never the less I launch into an attack on one about the same size as me and deliver a good slashing bite to its left front leg- making it limp. Soon it will fall behind the herd and I will have a good feed of sauropod- a meal I have not enjoyed in several months!!! Cau, A.; Dalla Vecchia, F.M. ; Fabbri, M. (2011). "Evidence of a new carcharodontosaurid from the Upper Cretaceous of Morocco". Acta Palaeontologica Polonica, in press. doi: 10.4202/app.2011.0043. Loeuff, et al. Vertebrate assemblages from the early Late Cretaceous of Morocco: an Overview. Journal of African Earth Sciences. 2010. Yes!!! Someone else respects the importance of giant predators!!!!! !